In Defense of Troublemakers. I love the title. Who doesn’t want to be a troublemaker? Charlan Nemeth is a professor at Berkeley of Psychology. She’s studied the role of dissent in group decision-making and written this book on the topic. It’s a critical part of a functioning team. The minority, dissenting opinion in an argument is essential to ensure we make the best decisions. When we are exposed to dissent, our thinking does not narrow as it does when we are exposed to consensus. In fact, dissent broadens our thinking. Importantly, dissenting opinions don’t have to be correct to improve the decision. Dissent breaks the blind following of the consensus and dissent stimulates thought that is more divergent. By exploring a problem space more broadly, a group makes a better decision. But dissent in a room must be genuine. Tools like playing Devil’s Advocate work only if the person playing Satan’s lawyer genuinely believes in the dissenting view or genuinely wants to explore the other argument. Creating a culture that actively encourages dissent is one of the hardest managerial challenges. Teammates must trust each other to be able to argue a minority position, and to feel confident enough to explore new angles, share new data points, and take the time to debate an issue, rather than simply agreeing with the majority. 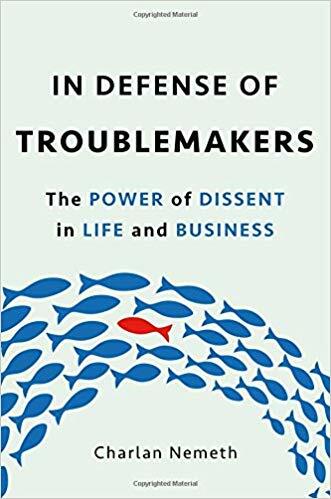 If you’re curious about the research and findings on dissent, and the techniques to foster more dissent within your team, this is a good book.